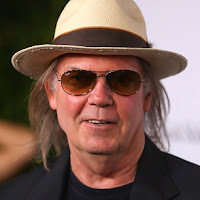 Canadian singer and song writer, Neil Young, has revealed his new Pono music service (which is slated for launch next year) will provide the best sounding music available for download. In a recent interview with David Letterman he explained that music in the Pono format won't suffer from the downgrade that music normally gets when encoded in popular formats likeAAC (used for the iTunes Store) and MP3. Instead, the audio files will be as good as mastered recordings and will give an analog-sounding feel just like true studio recordings. As well as the music service, Neil Young also showcased a Pono portable player that will be able to play music in the service's high resolution format (rumored to be 192kHz / 24-bit) -- traditional formats will also be playable. There's also talk of software as part of the Pono service which will be able to take your digital music files and convert them to analog-sounding files. There's no word yet on how this will be achieved, but the software will probably use some kind of audio compressor to create the analog sound -- maybe similar in function to VST plugins you can get for digital audio workstations (DAWs) perhaps? Apple has been very successful in using its iTunes Store to drive sales of iPods, iPhones, and iPad devices, but can Pono do the same? Can it really capture enough of the music download market with the promise of studio quality music?